The world is a guest in Kiel. The Juniorsuiten with a view of the Baltic Sea offer direct views of the beach. The Kiel Fjord is one of the most popular sailing regattas in the world, while Kiel is home to luxurious cruise ships. The Kiel Canal is the world’s most popular artificial waterway. 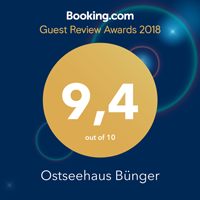 The Ostseehaus Bünger offers you at this meeting place of the sea giants a true slot place for the Ship Watching. Please take a look at our packages!